On June 9, the Gaspee attempted to stop and search the Hannah, a small trader from Newport bound for Providence. The captain of the Hannah, Benjamin Lindsey, refused to comply even after warning shots were fired from the Gaspee. Lindsey lured Dudingston into an area off Namquid point, an area which Lindsey knew to be very shallow at low tide. By two o'clock, the Gaspee had run aground and the Hannah raced away. Upon arrival in Providence, Lindsey informed John Brown of his experiences. Brown saw this as an opportunity for revenge and called upon his loyal sea captain, Abraham Whipple, to muster a crew. Within a few hours, the sixty men shoved off from Fenner's Warf to make the six mile journey to where the Gaspee was stranded. The dark moonless evening kept the longboats out of sight until they were within 60 to 100 yards of the ship. This was important because each man knew that if they were detected, the eight large guns of the Gaspee would tear them to shreds. By the time the Gaspee's sentinel raised the alarm, the ship was surrounded. John Brown, describing himself as the Sheriff of Kent County, called for the surrender of the Gaspee and Lieutenant Dudingston. In response, Dudingston ordered the crew to fire upon anyone who attempted to board the ship. Shortly thereafter, the Rhode Islanders rushed the decks of the Gaspee and, in the melee, Dudingston was struck by a musket ball in the arm and fell to the deck. The remainder of the crew, most of whom were asleep below deck, were overcome by the raiding party and Dudingston was forced to surrender. The captured crew was bound, placed into the longboats, and placed on shore in the Pawtuxet area. 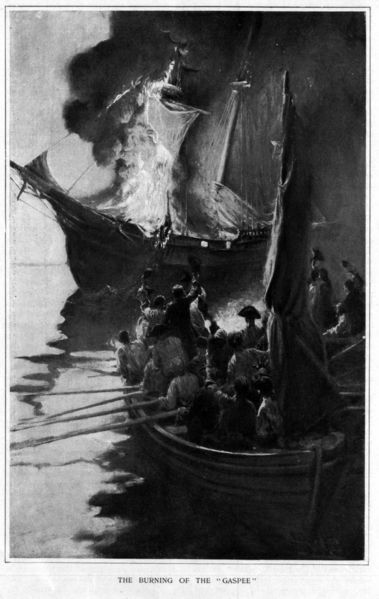 The leaders then removed most of the documents aboard the Gaspee and ordered the ship to be burned. Little did they realize that the flames that reached into the night sky were, in reality, lighting the way to the forthcoming American Revolution. The following day, the towns of Providence, Bristol, and Newport were abuzz with the events of the previous evening. Many people saw the flames and heard the explosions. Yet, when the investigation of the Gaspee affair was opened on June 10, 1772 until its closure a year later, not one individual claimed to know any detail surrounding those involved or the course of action. It was not until after the Americans had succeeded in obtaining their independence that the stories were told and written. On June 9, 1772, a local vessel out of Newport was under way to Providence when its captain baited the HMS Gaspee and lead Duddington into shallow waters near Warwick. 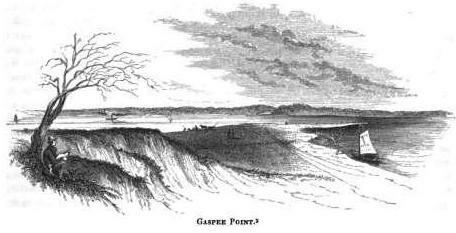 The Gaspee ran aground at a place that is now known as Gaspee point. News of the grounding quickly reached Providence and a party of fifty five, lead by a man named John Brown, planned an attack on the ship. The following evening they surrounded and boarded the Gaspee, wounding Duddington and capturing the entire crew. All were hauled ashore and abandoned, to watch as the Gaspee was looted and then burned. Previous attacks by the colonials on British naval vessels had gone unpunished. In one case, a customs yacht was actually destroyed (also by fire) with no administrative response. But in 1772, the Admiralty would not ignore the destruction of one of its military vessels on station. The American Department consulted the Solicitor and Attorney Generals, who investigated and advised the Privy Council on the legal and constitutional options available. The Crown turned to a centuries-old institution of investigation, the Royal Commission of Inquiry. This commission would be made up of the chiefs of the supreme courts of Massachusetts, New York, and New Jersey, the judge of the vice-admiralty of Boston, and the governor of Rhode Island, Joseph Wanton. The Dockyard Act, passed three months earlier in April, allowed those suspected of burning His Majesty's vessels, to be tried in England. But this was not the law that would be used against the Gaspee raiders; they would be charged with treason. The task of the commission was to determine against which colonists there was sufficient evidence for their trial in England. The Commission was unable to obtain sufficient evidence and declared their inability to deal with the case. In Boston, a little-known visiting minister, John Allen at Second Baptist Church preached a sermon that utilized the Gaspée Affair to warn listeners about greedy monarchs, corrupt judges and conspiracies at high levels in the London government. This sermon was printed seven different times in four colonial cities, becoming one of the most popular pamphlets of Colonial British America. This pamphlet, along with the incendiary rhetoric of numerous colonial newspaper editors, awoke colonial Whigs from a lull of inactivity in 1772, thus inaugurating a series of conflicts that would culminate in the Battles of Lexington and Concord.